Harold “Doc” Edgerton (1903-1990) was an American artist and engineer who is well recognized for his pioneering contributions to the development and transformation of the photographic medium through the use of the stroboscope. Dubbed “the man who made time stand still” in 1987 by National Geographic, Edgerton’s high speed images of moving objects aimed to make visible time itself through a bridging of art and science. Whether the subject matter being a bullet shot through an apple or a pole vaulter taking flight, his iconic and awe-inspiring photographs capture the unseen as well as the popular imagination. This exhibition is comprised of 30 recently acquired prints by Edgerton that serve as a testament to his innovative and experimental practice. For more information on Harold Edgerton visit the Edgerton Digital Collections project. 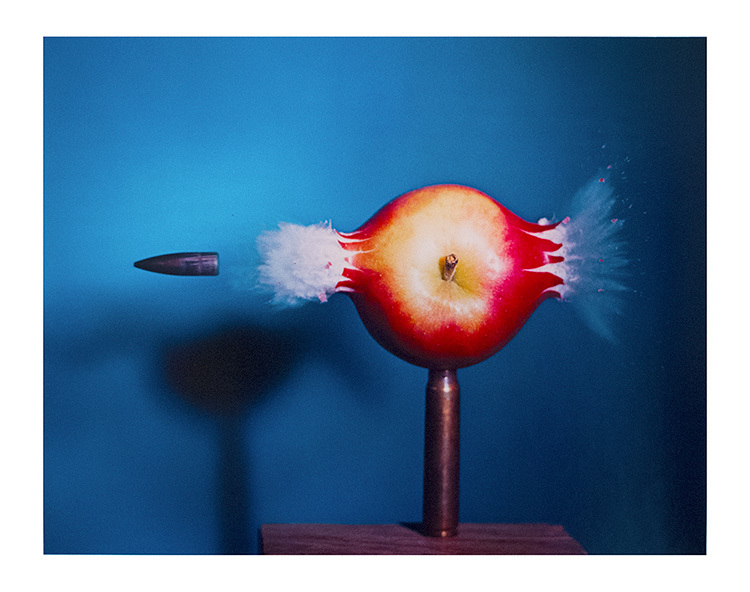 Image: Harold Edgerton, Bullet Through Apple, 1964 (printed in 1984) Dye transfer print on paper, /240 40.8 x 50.8 cm 16.063 x 20 inches. © 2010 MIT. Courtesy of MIT.